Winter is just around the corner. Our fleet is stacked neatly in the boatyard on Canal Street. We've even had our post-season Party. We can forget about sailing and Sail Chicago for the next few months. Or can we? 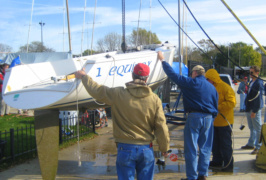 Remember, as a community sailing program, we are an all-volunteer organization. 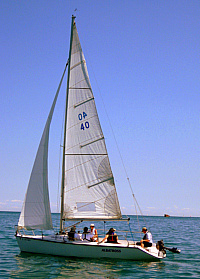 The main reason that we can offer such uniquely affordable instruction and sailing opportunities to our members and others in the Chicago area is that our dedicated members put in countless hours of service staffing our instruction programs, performing administrative roles, and now most importantly, maintaining our fleet so that future members and students will be able to enjoy sailing on beautiful Lake Michigan. It's during the late fall and early spring months that a great deal of this maintenance work is performed. Patching, repairing, and cleaning our boats and rigging, sorting and repairing our sails, and insuring that each boat is provided with the necessary safety equipment are just a few of the important maintenance tasks that will be carried out. membership program. While new members don't have a service requirement in their first year, they need to have signed up for an activity that will fulfill the requirement by the beginning of the next sailing season if they wish to participate in any on-the-water activities. Returning members in their third year and beyond must have fulfilled their service requirement by the start of the new sailing season. Two articles in this issue of Between the Sheets give you details about ways in which you can meet your annual service requirement and have a good time doing it. Sail Chicago fleet. The Board counts on member input to create programs and policies that really fit the way members make use of Sail Chicago. In the next day or two, current members will receive an emailed invitation to participate in this short survey. Please click on the link in the email. That will take you right to the survey. It will take no more than a few minutes to click through. And there's plenty of room for you to add comments and suggestions if you'd like. Thanks for your help! Insurance/Licensing: Help with keeping our insurance and individual boat licenses current. If you need more information or would like to volunteer, please contact me. Tom Peterson and I are identifying projects that can be carried out through the off-season. These projects will fulfill member service obligations for 2019. Some can be accomplished by individual members, and some will require small teams (typically two to four members). A wide variety of projects will be offered, including hardware installation on the boats, sail cleaning, and protocol writing. Some work will take place in the boat yard, some in a more controlled environment, and some can be done from the comfort of home. Detailed information on specific projects will be posted as "Announcements" on the Landing Page of the Sail Chicago website as their scope and requirements are finalized. So, check there on a regular basis in the coming weeks if you are looking for new ways to satisfy your membership service obligation. 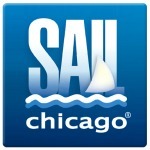 to attend Sail Chicago's annual Post-Season Awards Dinner and Celebration. Everyone agreed that Columbia's floating home provided a great nautical venue for such a festive occasion. The party gave both members and guests an opportunity to reminisce about the recent sailing season and to make preliminary plans for the next one. In the meantime, there were a variety of drinks and some fabulous food to enjoy, old and new friends to meet, and fun to be had. 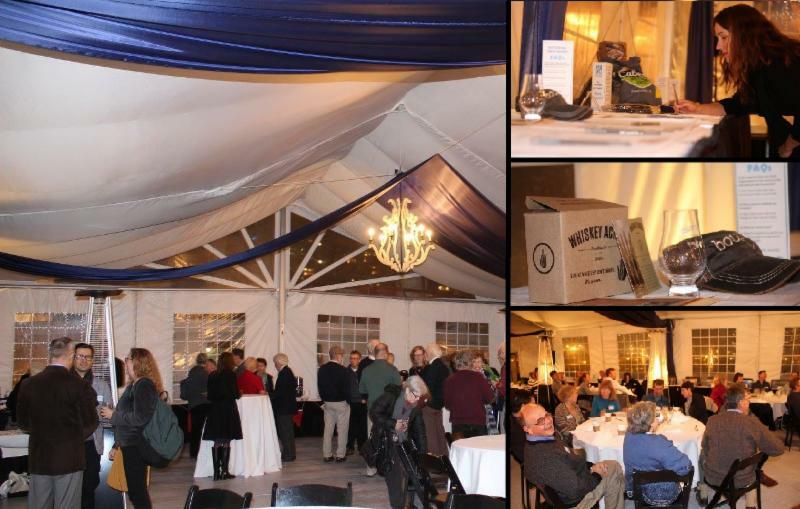 A silent auction of nautically-themed items was a welcome addition to the festivities. Proceeds from the auction will go toward the maintenance of our fleet. Many, many thanks to Sarah Wirth and Rachel Granneman who created for us a truly memorable evening. It was much appreciated by all who attended. As recently as mid-October, I saw some of our skippers trying to steer the Colgates one way or another with the tiller pushed all the way back, suddenly looking perplexed as nothing was happening and then trying to push even more. Of course, these skippers momentarily forgot that this action acts more as a brake on the boat rather than turning the boat. I have done it recently myself as it seems to be instinctive to push the tiller further the more the more you want to turn, but we know that this just puts the rudder at a right angle to the forward way of the boat, slowing or stopping it. Sail trim is also key to turning the boat, especially in heavy winds. For example, you can only fall off quickly if you ease the main; this is especially important in crew-overboard maneuvers when a quick dip downwind is necessary and just does not happen until the main is eased. Finally, do not forget that weight and heel will help you turn the boat; especially in lighter winds where slight changes in boat trim (by moving crew around) can pay deep dividends when racing. Although these are simple ideas, they can be easily forgotten in tense situations and when in close quarters. I use the winter to reflect on and visualize these ideas so that they become instinctive next season. hour-and-a-half. So, we decided to prolong our enjoyment by dousing our jib and sailing around the Montrose area and giving our tracking App a workout! We met Tim Rice en route on Blue Fish who also took advantage of the summer-like conditions to sail around with his crew, Debbie Natoli and Eugene Novikov. Later, Manoel Conde with Ken Sinko sailed Solstice into the harbor just before sunset. If you missed the opportunity to take one of our Colgates down the Chicago River to its winter quarters, you can still share in the fun in virtual reality. Just click here to join the crew. Our thanks to Sail Chicago member Mike Frost for documenting the journey.